to be a three straight year selection to the Southern California Super Lawyers Rising Star list (top 2 Â˝% of lawyers in California) and is recognized as one of Southern Californiaâ&#x20AC;&#x2122;s â&#x20AC;&#x153;Top Attorneysâ&#x20AC;? as published in Los Angeles Magazine. He is honored to be designated an â&#x20AC;&#x153;ACS-CHAL Forensic Lawyer-Scientistâ&#x20AC;? by the American Chemical Society having obtained the highest student score on the examination among all California lawyers. VROLGGUXJGRVHDQDO\VLV'1$DLUZD\ gas exchange, and is the only Kern County Defense attorney to be trained in drug recognition examinations. He is routinely asked to consult with both private and public attorneys throughout the country on issues of toxicology and pharmacology. MR. BREHMER IS HONORED TO have presented multiple times to the American Academy of Forensic Sciences, the American Chemical Society, state and local public defender associations across the country, state defense bar conferences, law schools, and others associated with the forensic and legal community. JEREMY BREHMER FELLOW AAFS In February 2016 Mr. Brehmer was recognized by the President of the American Academy of Forensic Sciences for his substantial contribution to the Academy. 0U%UHKPHUZDVUHFHQWO\VHOHFWHGWRPRGHUDWHWKHĂ?QDOMXULVSUXGHQFHVHVVLRQRIWKH American Academy of Forensic Sciences annual meeting in Florida. The 20 Under 40 contest selects 20 locals who are under the age of 40 and are considered a trailblazer in his or her professional career or schooling and known for giving back to our community in special ways. Winners will be honored in our July issue and at a special get-together. TO NOMINATE: Visit bakersfieldlife.com and click on the 20 Under 40 banner from now until April 14. Submit a few comments about nominee and a photo. If you have any questions, contact Mark Nessia at mnessia@bakersfield.com. Made In Bakersfield Generally we are known as an oil and agriculture town, but there are actually a host of other products produced here. Some you know and others may surprise you. 58 Best-kept secret: The Gardens at Monji What was once a typical landscape construction yard and nursery is now a sprawling 2 acres of everchanging gardens. Your taxes are due. Now What? Wondering how the tax law changes benefit you? The experienced professionals at Brown Armstrong can help you. Earn, Save, Grow, Protect Every Dollar! At Brown Armstrong, we maintain more than just “accounts” – we build strong relationships with friends and provide solid advice and strategies to maximize their money! Our business and personal tax specialists can provide answers and guidance for scenarios you may not even know exist. Brown Armstrong: Strategic, Innovative, Trustworthy, Experienced, Local Contact Brown Armstrong today for your tax needs – you can’t afford not to! Intelligent money management with professional accounting services. That’s what we do! Find out what legendary rock tribute band will be playing at the first-ever American Cancer Society benefit concert on Page 12. “Dining With Dre” visits Muertos Kitchen & Lounge to try out some very satisfying dishes on Page 16. Feast your eyes on the foods of India on Page 22. The Valley Children’s Ice Center of Bakersfield has taken the NHL’s “Hockey is for Everyone” initiative to the next level on Page 30. This is a great time of year to visit Palm Springs. Read about things to do when you visit on Page 36. Find out what the Wasting Hunger Not Food program is doing to help relieve hunger in Bakersfield and Kern County on Page 46. Meet the duo behind the city’s newest music store, Bakersfield Sound Co., on Page 70. SHARES What’s your favorite thing to do in Bakersfield in the springtime? 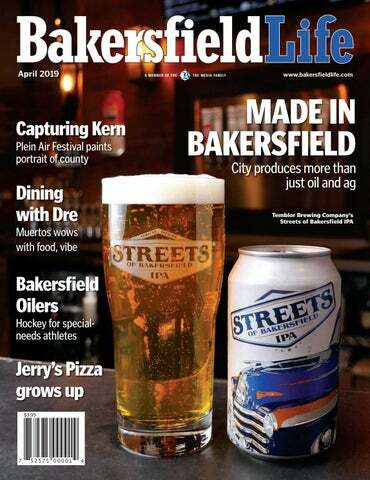 Temblor Brewing Company’s Streets of Bakersfield IPA is one of the many products proudly made in Bakersfield. Chandler at cchandler@bakersfield. com or 395-7521. 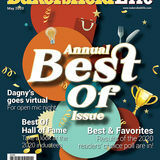 Bakersfield Life Magazine for your home or office, go to www.tbcoffers. com/deal/blifeintro. for your next event. Email Mark Nessia at mnessia@bakersfield.com or call 395-7383 for more information. We want to hear from you – Send comments or letters to the editor to Mark Nessia at mnessia@bakersfield. com. Please include name, city and phone number. We reserve the right to edit letters for clarity and to excerpt them. Trying to decide whether to remodel your home or build a new one? Michelle and Tim Hardt can take your â&#x20AC;&#x153;napkin ideasâ&#x20AC;? and create three-dimensional images of what your ideas will look like! Whether you want a home remodel, kitchen or bathroom renovation, or the design and build of a new home, we do it all. Hardworking and creative staff are the backbone of our success as a longtime local residential contractor. A couple of months ago, I had the privilege of being a member of a panel for the Kern Economic Development Foundation’s first-ever Aspire Conference, speaking to about 220 high school juniors and seniors who were on track to graduate high school and head off to college – some of them being the first in their family to do so. The theme of the event was “Success In and Beyond High School” and the panel talked about why Kern County is a great place to start a life after finishing one’s education. At the beginning of the panel, the attendees were asked a simple question: “How many of you plan on staying or returning to Kern County after finishing school?” Very few rose their hands. While disappointing, in truth, the response wasn’t that surprising. After all, most kids who grow up in one place for the majority of their lives naturally yearn to see what else the world has to offer. It was no different than my hometown of Simi Valley, where all my friends couldn’t wait to pack up, leave and never come back. Even though I didn’t mind staying, I, too, packed up, left and never came back. But that’s because the place I relocated to was Bakersfield. Bakersfield grows on you, whether you want it to or not. The community is unique and you can forge your own path and come into your own here. Bakersfield allowed me to reach my potential. When I moved here, I was soft-spoken and timid. Now … well, let’s just say some people probably wish I was still soft-spoken and timid. Bakersfield provided me with opportunities I would never have dreamed of had I been anywhere else. It’s really hard to imagine where I’d be had the road taken me in a different direction. I think that many of those students will realize what they had in Bakersfield as soon as they leave it. That’s why so many who didn’t raise their hands will eventually come back. But it’s unrealistic to expect everyone to stay or return, so I encouraged those who do leave to be proud of where they come from – to have pride in their hometown. They will be the ones who put Bakersfield on the maps of strange friends and friendly strangers in places far and wide, so let us speak highly of it to help change the narrative surrounding our city – to be advocates for the place many grew up in and many others call home. Some of us were made by Bakersfield. But all of us make Bakersfield. Find out what’s “Happening” in April on Page 14. SCIENCE MEETS JOB FAIR DURING THIRD ANNUAL KERN COUNTY STEMPOSIUM The third annual Kern County STEMposium returns to the Kern County Fairgrounds, 1142 S. P St., April 10, from 9 a.m. to 2 p.m. The “science meets job fair” brings together students of all ages and connects them with working professionals in STEM fields. High school students will demonstrate STEM projects while businesses will display equipment and demonstrate skills needed to be successful in the industry. Speakers will deliver informative talks throughout the day benefitting students, educators and businesses alike. For school sign-ups, event sponsorships and more information, contact Cheryl Scott at 661-862-5162 or cheryl@kedc.com. LOCAL ARTIST TO HOST PAPERCUTTING WORKSHOP AT BMOA TRIBUTE TO LEGENDARY ROCK BAND HIGHLIGHTS FIRST-EVER AMERICAN CANCER SOCIETY BENEFIT CONCERT The American Cancer Society will hold its first-ever benefit concert April 4 at the Bakersfield Music Hall of Fame, 2230 Q St. Queen Nation, a tribute to the music of Queen, will headline the show. Tickets are $75 for individuals and $140 for couples with 100 percent of the proceeds benefitting the American Cancer Society. Doors open at 6:30 p.m. and the show starts at 7:30. For more information and to buy tickets, go to www.acscabk.ejoinme.org/benefitconcert. Artist Liz Sherwyn will host a paper-cutting workshop April 27, from 10 a.m. to 12:30 p.m., at the Bakersfield Museum of Art, 1930 R St. The workshop is ideal for beginners interested in the art of papercutting, using X-Acto knives to explore techniques in drawing and composition and leaving with their own work ready to be framed. Sherwyn has been working in the paper-cutting medium for 10 years, hosting various exhibitions and receiving numerous awards for her work. Admission is $65 for members and $75 for nonmembers and includes materials. For more information, go to www.bmoa.org/workshop. MISSION AT KERN COUNTY HOSTS ANNUAL 5K AT CALM The Mission at Kern County will host its sixth annual 5K run/walk April 20, from 8 to 10 a.m., at CALM, 10500 Alfred Harrell Highway. The event features a pancake breakfast, T-shirts and medals for participants. Last year, nearly 500 runners and walkers enjoyed a day of fitness, food and fun and this year, up to 600 are projected to attend. The Mission at Kern County helps individuals struggling with chronic homelessness and addictions and is over 92 percent donor and volunteer driven. Preregistration tickets are $30 and late/day-of registration is $35. For more information, call 661325-0863. Find more community events at www.bakersfield.com/events. Post your event there or submit via email to bakersfieldlife@bakersfield.com. In the first episode of the “Dining with Dre” web series, Andrea Saavedra chats with Muertos owner Shawna Haddad Byers and discovers the inspiration behind the popular downtown restaurant. Watch at www.bakersfieldlife.com. to try a restaurant that was down an alley but I’m glad I did. Muertos has a colorful history that is timeless and cuisine that is delicious. Its modern American menu takes the cake with all your favorites that are just a cut above the rest. THE BLVD The BLVD has a thoughtfully crafted menu featuring gastropub-style farmto-table cuisine. Shared plates include items ranging from ahi tuna poke stack to bacon jalapeno wontons. Guests who are interested in larger meals can choose from dishes such as our signature hearth-oven pizzas with made-from-scratch pizza dough, beer-battered fish and chips, and handcrafted burgers! Available Monday-Friday from 11 a.m. to 3 p.m., the signature lunch menu features eats for $10 or select two items for $15. BANGKOK STREET FOOD Come enjoy some fantastic Thai food at Bangkok Street Food! With our family’s recipes, we use quality ingredients to serve you great food at affordable prices. Try our spicyand-sour tom yum noodle soup with your choice of noodles or our special, flavorful drunken noodles. Pair your dish with some of our amazing drinks, such as the Thai iced tea and you’re all set! REMIX ASIAN KITCHEN ReMix Asian Kitchen is renowned for its quality comfort food with an Asian twist. ReMix serves modern and traditional favorites like prime Korean barbecue, Hawaiian plate lunches, fresh seafood and a dizzying variety of specials. The menu is constantly evolving and they’ve now added a new ramen menu. It’s something they've been refining for a while and it just might be the best in Bakersfield! SHRIMP COC0NUT CURRY + MANGO CHICKEN + GARLIC NAAN & RICE These dishes are like manna from heaven. The sauces are a bit sweet, a bit savory with a bit of heat. What makes them so appetizing are Indian spices like cumin, coriander, black mustard, garam masala, cardamom and turmeric. They make for strong flavors, but very pleasant tasting. Pour these rich, creamy sauces over your rice and sop them up with some garlic naan for a delicious meal. For an appetizer, try one of their most popular dishes, the Zaika assorted vegetarian sampler, with an assortment of their most popular vegetable appetizers, including samosas, vegetable pakoras, paneer pakora and aloo tikki. â&#x20AC;&#x201C; Zaika Indian Cuisine O BAR, 5123 Ming Ave.
MUSHROOM BHAJI + NAAN BREAD Mushroom bhaji is either a simple Indian stir-fry dish or a vegetable-filled fritter similar to pakora. At Taj Mahal, the elder statesman of local Indian restaurants, it is the former, with mushrooms simmered with tomatoes, onions, green peas and Indian spices. The peas add a hint of sweetness to this otherwise spicy dish and the succulent texture of the mushrooms is complemented by the crisp onions. It makes a delicious, satisfying dinner paired with an order of basmati rice, garlic naan and one of the handful of Indian beers the restaurant offers. â&#x20AC;&#x201C; Taj Mahal, 5416 California Ave.
CHICKEN TIKKA Ming Plaza is home to a variety of ethnic restaurants, from Greek, Mexican, Vietnamese and more, but the star of the area has to be New Taj Palace and its amazing array of traditional and regional Indian dishes. The chicken tikka, served on a sizzling-hot skillet, is flavorful and juicy with the perfect amount of char. Garnished with green peppers, lemon slices, onions and cilantro, it serves as a great entree to eat alongside warm naan or pilau rice. â&#x20AC;&#x201C; New Taj Palace, 3805 Ming Ave.
Bakersfield’s list of successful “homegrown” businesses rivals most cities. Have you ever wondered how the founding entrepreneurs of these flourishing businesses got started? Some would-be entrepreneurs spend years searching for the “perfect idea” to start a business and never pull the trigger. If you are thinking about launching a business, there’s a lot to consider. Here’s an overview of what you need to make it happen. Refine your idea If you have a business idea, balance it with reality. Be able to solve a problem, fulfill a need or offer something the market wants. Ask yourself who else is doing it and how you can do it better. Be prepared to explain a short “elevator pitch” to an investor. Build a plan There are no limits on who can become an entrepreneur. You don’t necessarily need a college degree or a ton of money, but you definitely need a plan. A business plan is your roadmap for how you will run your business. The Small Business Administration is a helpful resource at www.sba.gov as well as our local Small Business Development Center at CSU Bakersfield. Assess finances Now that you’ve mapped out your plan, you have a clearer picture of how much it will cost to get started. Do you have available funds or will you need to borrow money? If you’re planning to leave your current job to focus on your business, do you have money socked away to support yourself until you turn a profit? Select your business location This is an important decision. Whether it’s a physical location or an online presence, your choice could affect your revenue, taxes and legal requirements. Register your business If you’re working with an attorney, they’ll help you through necessary registrations, licenses and permits. If navigating on your own, there’s a wealth of resources to tap such as the California Business Portal at www. businessportal.ca.gov. Licenses, permits and certifications vary depending on your business type, so check out www.calgold.ca.gov. Build your team A business is only as good as the people behind it. Fill the gaps of your limited experience with strong team members. Consider your hiring or outsourcing needs. Hiring is fraught with regulations. This may be an area where you lean on experts or seek training. Track your finances Separate business from personal and open a business bank account. You’ll want to track income and expenses at a minimum. QuickBooks is widely popular with small businesses for its ease of use and valuable reporting features. Protect yourself You’ll need insurance for the risks you’ll face. A reputable insurance agent will help determine appropriate coverage for your business. Depending on your needs, common insurance policies include general liability, professional liability, commercial property, workers’ compensation, employment practices liability, product liability, home-based business and commercial auto insurance. The bottom line Turn your idea into a revenue stream. With a little homework, you may be the next booming Bakersfield business. Above: Artist Dagmar Alexandersson poses with one of her faux-finished cabinet doors. Left: Dining set with faux finish and Venetian plaster wall. Above: Accent wall with custom wallpaper. Faux painting is a timeless art form. It is the art of recreating the look and feel of natural materials. It can turn new walls into old-world European castle walls or it can turn old furniture into new treasures. The possibilities are endless. There is not a single technique, but a collection of techniques and products meant for different looks. Artists can transform items to resemble something else. These projects can be DIY or you can call in a professional. Bakersfield is home to such an artist – Dagmar Alexandersson, also known as the “Queen of German Schmear.” Born and raised in Heidelberg, Germany, she moved across the pond to the Bay Area where she had a flourishing faux finishing business for 20 years. A few years back, she moved to Bakersfield to be close to family. Her European heritage combined with her sense for arts and interior design make her an ideal faux finisher. Her company, Dax-Studio, specializes in custom kitchen cabinetry, furniture faux finishing, custom wallpapers and stenciling. Dagmar has attended creative workshops around the world and has worked on everything from a 500-yearold castle to a movie star’s home. Her company provides full-service solutions, from preparing the walls by professional, licensed painters to faux finish artists all the way to interior design suggestions. WHAT YOU CAN TRANSFORM Kitchen cabinets. Turn your dark, dated cabinets into a French gourmet-looking kitchen without the cost of brand-new cabinetry. Accent walls. Transform an ordinary room into something wow with an impact wall. Dagmar uses various techniques like sandstone application, Venetian plasters, color wash treatments and custom-painted wallpapers to give the space a completely different feel. One of their most popular finishes is their Italian villa finish. Fireplaces. Today’s look is light and airy. Turn your dated brick fireplace into a charming room centerpiece. This design treatment is achieved by spreading wet mortar over the bricks, then removing some before it dries. It’s similar to whitewashing with diluted paint, but using mortar creates a rustic and distressed appearance. Powder rooms. Custompainted wallpaper is wonderful to use in small spaces to create high impact. Any color, pattern and texture can be created for the desired look. Furniture. Old, distressed furniture can be renewed through faux finishing on the frame and then reupholstered. For pickers out there, this is a great way to turn your vintage find into a timeless treasure. The air inside Valley Children’s Ice Center of Bakersfield is frigid and piercing, amplifying the sounds bouncing off the venue’s walls. On the north end of the rink, skates and sticks scrape and clank against the frozen surface as hockey players skate in circles. That is until a commanding voice cuts through the cold. “Andy’s coming!” Immediately, bodies hit the ice, motionless and silent. Scott Hay can’t help but smile as he skates past his “lifeless” players recreating the iconic scene from the movie “Toy Story.” This is his favorite drill. Among those playing dead are kids as young as 8 and adults in their late 20s who make up the Bakersfield Oilers roster, the latest entry in the hockey programs offered by the Ice Center made possible with the help of the American Special Hockey Association and funding courtesy of Valley Children’s. More Information The team practices every Saturday at Valley Children’s Ice Center of Bakersfield, 1325 Q St. For more information, contact Scott Hay at 661-852-7401 or shay@vcicecenter.com. See the Bakersfield Oilers in action and find out what coach Scott Hay has to say about the benefits of hockey and why it’s for everyone. Watch at www.bakersfieldlife.com. IN BAKERSFIELD “The living presence of Jesus awakened joy and set people free.” – Brennan Manning, “The Ragamuffin Gospel” “Is it really that easy?” The caller on the other end was noticeably angry. No volunteering required? No minimum donation needed? No mandatory acts of service? He had spent his whole life believing that salvation was something to be earned, not a gift to be accepted. “Yes, it is.” Life FM DJ Jon Engen, who happens to be a former pastor, reassured the man and encouraged him to go to church. There, he could learn more about how Jesus died on the cross to forgive the sins of the world and give everlasting life to anyone who believed. That’s it. Attention to detail! Artist Anette Power of Newberry Park, CA is closed to finishing her oil of a tractor at the Tracy Ranch for the Kern County Plein Air Painting Festival. annual event with seven returning from previous festivals. The majority of the professionals reside in California, with a few bringing their talents from the Western United States. The group of painters will not only bring years of experience to the canvas, but engage viewers as they paint Kern County one portrait at a time. The festival kicks off with a reception at the Kern County Museum, 3801 Chester Ave., April 8, from 8 to 11 a.m., where guests can enjoy Covenant Coffee, meet the artists and watch them paint at the museum. On April 11, from 2 to 5:30 p.m., the artists will paint on the sidewalks of 19th and Eye streets in downtown Bakersfield followed by a meet and greet from 5:30 to 7 at the Bakersfield Art Association, 1607 19th St. The event wraps up with the Plein Air Awards and Sales Gala at the Betty Younger Sculpture Garden at 1330 Truxtun Ave. April 13, from 5:30 to 8 p.m. Admission is $45 and can be purchased at www.kernarts.org. that motivation comes from being given a platform. Ramirez has set up writing workshops at The Mission at Kern County to open dialogue and give people a chance to open up and be vulnerable in anticipation for the portraits being taken. However, she soon realized the benefits of these workshops had beyond the purpose for the event. “I’m hoping to have more writing workshops or perhaps art workshops for those adults that have a second chance at life because art and poetry are therapeutic. I thought this is a perfect way to integrate art,” said Ramirez. The exhibit is giving those who have faced, or are currently facing, homelessness a chance to share their stories. It allows for a platform to connect with others and motivate them through art. Both Valdez and Ramirez hope to inspire the community to see themselves in their stories. The event is free and opened to the public. Murray Canyon Trail, which leads you through a forest of palm trees where you have the option of two paths – one down by the creek and one up in the hills. The early Agua Caliente Indian tribe chose this area to settle in and I can see why. Gorgeous views and probably very cool in the hot summer months. Palm Springs Aerial Tramway: A visit to Palm Springs is not complete without a tram ride to the top of San Jacinto Peak. It’s at an elevation of 8,516 feet and takes about 10 minutes to get to the top. On our visit, even though the base was a nice 60 degrees, the top was 9 degrees with snow flurries and the wind blowing, so plan well with what you wear. The top lodge area has two restaurants, a museum and multiple observation decks. Many locals buy passes and take advantage of the 50-plus miles of hiking trails. LODGING No matter where you stay, there will be a gorgeous mountain view and a sparkling pool nearby. Accommodations vary from luxurious golf resorts to swanky hotels to retro retreats. In booking our hotel, I learned there’s mid-century modern hotels from the ’50s with bright-colored paint jobs and there’s mid-century modern hotels new and nice. We stayed at Alcazar Palm Springs, a Spanish-style boutique hotel with a modern twist and fully enjoyed our time there. Palm Springs is a foodie’s delight. There are several types of restaurants to choose from, like swanky and colorful, modern chic to charming European bistro. I would recommend these locations on Palm Canyon Drive: Lulu California Bistro is the quintessential Palm Springs place to eat. It’s glitzy, colorful and fun. Also try Cheeky’s, a Palm Springs institution known for its breakfast. The menu changes weekly and is praised for its farm-to-table cuisine. Lastly, Las Casuelas Terraza has been serving up authentic Mexican cuisine for more than 60 years. A great place to relax after a day of shopping and enjoy a margarita under their massive palapa bar. Design District” with home furnishing stores. To fully appreciate the Palm Springs lifestyle, some appreciation needs to be put toward the mid-century modern looks. Several stores offer vintage, colorful retro-looking home decor items from the original to today’s twist on mid-century. Stores like Victoria’s Attic Antique Mall, Christopher Kennedy and Just Modern are fun to look around in. ARCHITECTURE The city of Palm Springs is noted for its many examples of mid-century modern architecture. Many well-known architects have given Palm Springs its unique look, dating back to the early ’30s with Lloyd Wright, son of Frank Lloyd Wright. Whole neighborhoods are mid-century modern style with many of them lovingly restored and updated, complete with desert landscape yards. Celebrities have flocked here for years and tours are available to see the likes of Frank Sinatra’s Twin Palms Estate to Elvis’ Honeymoon Hideaway and more. OSTEOARTHRITIS MORE THAN JUST THE PAIN When Dr. Timothy Galan joined Mayo Clinic as an adult reconstruction fellow, he was involved in research looking into what causes pain in patients with knee osteoarthritis and how a knee replacement surgery can improve quality of life. He recently joined Dignity Health and sees patients at Mercy Hospital Southwest and Truxtun. His focus is to improve patient outcomes utilizing new techniques and technology. This includes nonoperative management of hip and knee osteoarthritis. And when the surgery is the last resort, Dr. Galan utilizes computer navigation and robotics assistance to ensure operation is accomplished with precision and accuracy. Dr. Galan is an experienced orthopedic surgeon specializing in hip and knee osteoarthritis and joint replacement procedures. Dr. Galan is fellowship trained in adult reconstruction, but he also specializes in lower extremity injuries and fracture care. Symptoms to watch out for Osteoarthritis is the most common joint disorder in the United States. Among adults 60 years of age or older the prevalence of symptomatic knee osteoarthritis is approximately 10 percent in men and 13 percent in women. Osteoarthritis is also the most common reason for total hip and total knee replacement. Common symptoms of osteoarthritis are: • Pain. • Tenderness. • Stiffness. • Loss of flexibility. • A grating sensation when you use the joint. Diagnosing the problem History and physical examination of the patient as well as simple radiographs are all it takes to diagnose osteoarthritis. Patients typically endure pain for several months or even years before seeking medical attention. Osteoarthritis is a progressive disease when the cartilage that cushions the ends of bones in your joints gradually deteriorates. In osteoarthritis, the slick surface of the cartilage becomes rough. Eventually, if the cartilage wears down completely, you may be left with bone rubbing on bone. Knee and hip replacement surgery – also known as joint arthroplasty – can help relieve pain and restore function in severely diseased knee and hip joints. The procedure involves cutting away damaged bone and cartilage and replacing it with an artificial joint (prosthesis) made of metal alloys, high-grade plastics and polymers. “For most people, knee and hip replacement provide pain relief, improved mobility and a better quality of life. And most joint replacements can be expected to last more than 15 to 20 years,” said Dr. Galan. Osteoarthritis is a degenerative disease that worsens over time. Joint pain and stiffness may become severe enough to make daily tasks difficult. Some people are no longer able to work. When joint pain is this severe, doctors may suggest joint replacement surgery. People who need joint replacement surgery usually have problems walking, climbing stairs, and getting in and out of chairs. Some also have knee pain at rest. Dr. Galan’s strongest piece of advice is not to wait until the condition is very debilitating and severe joint deformity is present. If you are experiencing symptoms of osteoarthritis, talk to your primary care physician. It does not mean you will need surgery. Other nonsurgical alternatives to osteoarthritis can be utilized at early stages. Quality of life is important at any age, especially since we are able to improve and maintain it with modern medicine. Orthopedic Joint & Revision Surgeon Dr. Galan is a fellowship trained orthopedic surgeon specializing in an array of minimally invasive techniques in joint replacement, preservation and revision. He has had comprehensive training in the field of adult orthopedic joint reconstruction. Prior to medical school, Dr. Galan worked as a nurse for four and half years. Dr. Galan obtained his post graduate education at the University of California San Francisco Fresno where he completed his orthopedic surgery residency. It was at UCSF Fresno where Dr. Galan served as the orthopedic surgery Chief of Trauma. He participates in several ongoing research studies on the evaluation and treatment of total joint replacements of the hip and knee and is credited in several peer review publications. Education and Accomplishments: • Rochester Community and Technical College, Rochester, MN – Associates of Science Nursing • University of Minnesota Medical School, Minneapolis, MN – Doctor of Medicine • University of California San Francisco, Fresno Program, Fresno CA – Orthopedic Surgery Residency • Mayo Clinic Jacksonville – Adult Reconstruction Fellowship • American College of Surgeons – Resident Member • American Academy of Orthopedic Surgeons – Resident Member • American Association of Hip & Knee Surgeons – Candidate Member After completing his orthopedic surgery residency, Dr. Galan went on to complete his adult reconstruction fellowship at the world renowned Mayo Clinic in Jacksonville Florida where he studied complex total joint reconstruction and revision surgery. Dr. Galan is new to the Bakersfield community and enjoys sports, travelling, community involvement, and spending time with his family. He also enjoys learning about history, different cultures, cuisines, and art. He is looking forward to providing comprehensive orthopedic care alongside his colleagues at the Mercy Orthopedic, Spine & Hand Center. GYNECOLOGIC ONCOLOGY Kern Countyâ&#x20AC;&#x2122;s only full-time minimally invasive robotic-assisted gynecological surgeon now at Comprehensive Blood & Cancer Center What is gynecologic oncology? Gynecologic oncology is a subspecialty focused on the diagnosis and treatment of all types of cancers affecting the female reproductive system such as cervical, ovarian, vaginal, uterine and vulvar cancers. How many robotic surgeries have you performed? I have performed almost 1,000 robotic surgeries and have established the first full-time robotic gynecologic oncology program in Northeast Wisconsin over 10 years ago, becoming a proctor and instructor in robotic surgery. Why have you chosen to practice in the Central Valley? This region of California is significantly underserved for my specialty, and my hope and goal is that patients and their families no longer need to travel great distances to be treated with cutting-edge gynecologic cancer care. How is robotic surgery an improvement over conventional laparoscopy? There are quite a number of improvements with robotic surgery over conventional laparoscopy. For example, the camera optics allow 3D depth perspective viewing. Plus, the surgeon is able to maintain complete control of the camera and multiple different instruments, while conventional laparoscopy depends on assistants to control the camera. â&#x20AC;&#x153;Wristedâ&#x20AC;? instruments mimic real hand movements with a greater range of motion to allow operating at sharper angles, moving safely around anatomic structures. Most importantly there is a lower rate of converting to a larger open-abdominal incision for more difficult procedures. All of these benefits lead to a higher chance of success of the procedure with faster recovery and less pain. Does robotic surgery mean that a robot is performing the surgery? No, the surgeon is always in total control; the robot is merely a tool to enhance the work of the surgeon. These tools allow for greater precision, flexibility, control and a greater detailed 3D view, all through tiny incisions. This results in less pain, lower risk of infections or complications, less blood loss and less scarring for a faster return to normal life for the patient. down. “If the parents are worried, the kids learn how to worry about minor things,” he said. Parents who take the time to relax are more likely to have children who cope in the same healthy ways. Treat your body like the temple it is by adapting small lifestyle changes. Exercise is the best medicine by far, and Kern Behavioral Health is working to improve patient outcomes through yoga. “It is pretty well-documented that exercise and yoga really help to reduce stress and anxiety,” said Perez. “We push yoga practice and are giving pre- and post-stress tests to our clients. You can see levels of stress going down with just one session of yoga, but that applies to any kind of exercise.” Vigorous exercise not only pumps mood-boosting endorphins through your body, putting yourself through a rigorous workout can teach you how truly strong and resilient you are. Exercise is taking the time to care for yourself, and your mind and self-esteem get stronger as well as your body. it is important for any dieter to be meaning they are high in calories but satisfied with their meals to continue great for light but hearty preworkout eating healthier. snack. Blend nuts like cashews with “Even if you are not willing to lemon, spices and herbs to create a change your entire diet, at least focus light and creamy Alfredo dressing on adding healthful foods such as for pastas, salads and more without vegetables to your diet,” said Carter. butter or flour to use as a thickener. You are more likely to succeed Colorful root vegetables like sweet this way than banning foods from potatoes and cassava are filling, your shopping list. high in fiber and named “dietary Adding one serving of vegetables powerhouses” by Harvard Health. per day is a small Despite their but important nutritional “Even if you are not willing step, as well as value, be wary to change your entire diet, expanding your of the high palate by cooking carbohydrate at least focus on adding with uncommon content of healthful foods such as vegetables and some starchy vegetables to your diet.” fruits you find root vegetables, especialin the produce – Leah Carter, registered dietician ly potatoes. A section. A local example of this is Better Bowl’s sweet potato is more nutrient dense barbecue jackfruit bowl, which is a (and worth the calories) than a russet delicious play on a pulled pork sandpotato. wich paired with whole grains in a If you are not yet convinced to power-packed and filling meal. try a plant-based diet or even to try Legumes/beans are energy-rich one plant-based meal per day, start and packed with fiber, protein and replacing foods with relatively low vitamins, so adding one serving of nutritional value with flavorful, collegumes per day instead of meat can orful and nutrition-centric foods that greatly improve health outcomes come from plants. while leaving you feeling full and satCarter’s best advice: “Make one isfied. Beans, chickpeas, peas, lentils change at a time and it doesn’t have and soybeans are also in this family to be all or nothing.” of low-glycemic index foods. Even one small step toward a Nuts are high in protein and have healthier diet is better than no forhigh concentrations of nutritious oils, ward momentum at all. If you suffer from wounds that won't heal, whether due to diabetes or other health issues, you may need more than traditional treatment. The Bakersfield Heart Hospital Center for Wound Healing can help. Our specialists can determine why your wound isn't healing and create a personalized treatment plan that may include hyperbaric oxygen therapy. Don't let persistent wounds keep you from enjoying an active, normal life. Call the Center for Wound Healing today. City School District. “The kids really seem to understand how important it is to donate their uneaten food instead of throwing it away in the trash.” BCSD helped pilot the program late last year with five schools participating and has recently increased to 15 schools. Edison, Fairfax, Fruitvale, Greenfield and Kern High School districts are also donating food, making a total of 28 schools currently participating. Sully’s markets, Frugatti’s, La Costa Mariscos and Subway are also donating food to the program. Three refrigerated vans are deployed daily to rescue food around Bakersfield. Drivers, also known as food rescuers, are participants in Kern County homeless shelters’ job development programs. They themselves have experienced hunger, oftentimes homelessness, and now are given an opportunity to be employed and part of a communitywide effort to feed the hungry. Each driver is trained by Public Health’s Environmental Health Division on proper food handling and transport and are learning other important job skills like customer service and data entry. So where is the food going? Waste Hunger has partnered with CityServe and dozens of community churches in an attempt to deliver food directly into neighborhoods and into the hands of those in need. “Some churches receive a delivery of fresh food and then volunteers walk directly into the neighborhood with signs reading ‘free food’ and the families are so blessed, often crying because of their appreciation,” said Pastor Robin Robinson, CityServe Kern County coordinator. The donations are healthy products like milk, juice, fruit, vegetables and other wholesome foods. The goal is to bring food directly into neighborhoods rather than residents having to ride a bus or walk a long distance to get the food they need. Each church is trained by Public Health to ensure that food is stored and distributed properly. Waste Hunger Not Food is just in its infancy and has already rescued more than 110,000 pounds of food. Currently operating in Bakersfield, the intent is to expand to other Kern County areas in the coming years. One in 4 children in Kern County go to bed hungry every night. Michelle Corson is the public relations officer for the Kern County Public Health Services Department. For more information on health resources and programs, go to www. kernpublichealth.com. Learn how you can get involved by visiting www.wastehungerkerncounty.com. The Waste Hunger Not Food team at Sullyâ&#x20AC;&#x2122;s Kitchen. hough Bakersfield is generally known as an oil and agriculture town, there are actually a host of other products produced here, some of which are carried in stores throughout the area and others that are marketed and distributed around the globe. The list of locally produced product on following pages is by no means complete or exhaustive. If you know of something that you think should have been included, let us know about it by sending an email to bakersfieldlife@bakersfield.com. using sustainable, natural and humane agricultural practices. Cotton Candy Grapes – Created by Bakersfield’s International Fruit Genetics and grown and marketed exclusively in the U.S. by local company Grapery, Cotton Candy grapes are available from approximately Aug. 10 to Sept. 20. Grimmway carrots – Grimmway Farms is the world’s largest carrot grower and grows 65 varieties of organic produce that are shipped around the world. Redhouse Beef – Local 100 percent grass-fed and grass-finished beef. My Husband’s Nuts – Flavored almonds sold at retail stores nationwide. Sunridge Nurseries – Propagation and grafting of grape nursery stock for the wine industry. Company is the largest citrus grower in North America and has the world’s largest citrus processing plant. Other Wonderful products include, Wonderful Pistachios, Wonderful Almonds, Pom Wonderful, JUSTIN Wines and Teleflora. Cotton Candy grapes taste remarkably similar to cotton candy and have generated a lot of media buzz, being featured on national TV shows like “Good Morning America” and “The Today Show.” Distributed nationwide, they are available locally at Sweet Surrender and Sully’s during harvest. Water-air cooked beet, sweet potato and carrot chips are on the horizon. Great Change Brewing – West Coast-style beers known for being hoppy and clean. Mexican food products, since 1958. La Rosa Ice Cream and fruit bars – Frozen treats sold out of rolling coolers and in numerous stores throughout Bakersfield. Baker’s Outpost – Artisan microbakery. Paleta Company – Frozen treats and pop bars. Prodonuts – Gluten-free, protein-rich donuts. juices, smoothies and salad dressings. Bowen’s Whiskey – Small-batch whiskey aged in barrels made from fire-charred oak trees from the nearby Piute Mountains. Califa Farms – Plant-based milks creamers, coffee drinks, yogurt and juices sold worldwide. Crusader Brewing – The most recent addition to Bakersfield’s craft beer scene. Dewar’s chews – These taffy chews have been featured in Food Magazine, Food Network and at the red carpet at the Oscars. Dionysus Brewing Company – Local craft brewery famous for its barrel-aged sours. Gino’s Gelato – Handmade Italian ice cream Go Free potato chips – Water-air cooked instead of fried, they have 70 percent less fat and 25 percent fewer calories than traditional potato chips. producing a wide variety of frozen treats. Pyrenees bread – Authentic French sourdough found in stores and restaurants across the country. Shepherd’s Seasonings – Gourmet barbecue seasonings. Temblor Brewing – Craft brewery/ restaurant whose beer is found in stores throughout Kern County. Sports and entertainment Bakersfield Condors – Professional AHL hockey team affiliated with the NHL’s Edmonton Oilers. music made popular by Buck Owens, Merle Haggard and others. Derek Carr – Bakersfield Christian High School alum and current Oakland Raiders quarterback. Kevin Harvick – North High grad is one of the biggest names in NASCAR racing. Cody Kessler – Centennial graduate now plays quarterback for the Jacksonville Jaguars. Gregory Porter – Two-time Grammy Award-winning jazz singer and songwriter. Tyrone Wallace – Former BHS Driller is now a Los Angeles Clippers guard. bring the nu metal genre mainstream. Other Bakersfield Twang note cards – Features photos of local landmarks by longtime Bakersfield Californian photographer Felix Adamo. Calmini Products – Aftermarket performance truck suspension products. vacuum systems. Pioneer Paint – Manufacturer of high-quality paint products for architectural, industrial, agricultural and institutional applications. Slagle’s mattresses – Premium handcrafted mattress sets made to order. Whenâ&#x20AC;&#x2122;s the Best Time to Buy a House? OPEN HOUSE. View the list and map today! IHRLYZÃ&#x201E;LSKYLHS[VYJVThas accurate real estate in YLHS [PTL. We serve buyers, sellers and renters of properties with the best information and tools anytime, anywhere. When living at home is no longer the best option for your loved one, visit the private homes of Gables Residential Care. of these features is a huge 40-foot-long fountain wall that is simply breathtaking to behold. The main outdoor wedding space is a lush and expansive synthetic lawn area that is perfect for ceremonies or outdoor receptions. Beyond the beautiful gardens, the property boasts a bridal suite that is simply the best in the Central Valley. It’s spacious, with mirrors galore and true salon chairs to make getting ready as fun as the big day itself. Even the groom is catered to at The Gardens at Monji, with a handsome groom’s lounge complete with plenty of leather couches and a big-screen TV. There is also the modern, industrial-inspired grand hall for events big and small. Just outside the roll-up glass doors, guests can sit underneath the shade and comfort of a massive outdoor pergola, making this the perfect inside/outside event experience. Whether you’re planning a wedding, a corporate luncheon, a place for family photos or simply looking for an afternoon escape, we suggest a visit to one of Bakersfield’s best-kept secrets: The Gardens at Monji. The Gardens at Monji are open from 8 a.m. to 5 p.m., Monday through Friday, and 10 a.m. to 3 p.m., Saturday and Sunday. HIGHGATE SQUARE Designed for first-time buyers and young professionals. Six Castle & Cooke floor plans priced from the low $300’s. HIGHGATE PROPER Designed for growing families and move-up buyers. Six Castle & Cooke floor plans priced from the high $300’s. B h k private clubhouse l bh f residents d Breathtaking for off Highgate Square, Highgate Proper and Highgate Shires. Sparkling swimming pool, spa, fitness center, gourmet kitchen, meeting rooms, children's water spray park, tot lot playground, expansive park, amphitheater and basketball courts. HIGHGATE SHIRES Executive-level living with enhanced privacy and larger lot sizes. Homes by Castle & Cooke, Dave Packer Custom Builder, Gaskill-Rose Luxury Home Builders and George Delfino Homes. HIGHGATE REGENTS Stress-free, low maintenance, active adult living. Seven Castle & Cooke floor plans. Regency Club private swim and fitness center opening spring 2019 exclusively for Highgate Regents residents. Seven Oaks Country Club Membership Incentives Available* * Requires financing through Castle & Cooke Mortgage. Seven Oaks Country Club memberships subject to application approval. Lifesaving heart care inspired by your love. At Adventist Health Bakersfieldâ&#x20AC;&#x2122;s Accredited Heart Institute, we are inspired daily by our patients and their familiesâ&#x20AC;&#x201D;their love, their hope, their faith. While our expertise, quality and latest technologies are vital in healing, we never forget the important roles each family member and friend plays too. They inspire us to do more than deliver the most advanced lifesaving care. They inspire us to transform lives. Together inspiredÂŽ If you think you or a loved one are having a heart attack, call 911 and ask to be taken to Adventist Health Bakersfield. To learn the signs and symptoms of a heart attack, visit www.placeholder.org. For the last 31 years, I’ve had the privilege of connecting with people who are broken and hurting for many different reasons. Most of them have let their life circumstances keep them from living an intentional life that was intended for them. But I’ve had the opportunity to give some of them hope. Because of some of my personal struggles growing up, I recognize that a broken state – loss of hope – can lead to desperate pain and poor choices. I had a lot pain in my life because of a broken household. I turned to drugs and alcohol to find joy and fulfillment, which was a downward spiritual and psychological spiral. However, my life turned around so it’s been a blessing for me to bring hope to others so their lives can be different, regardless of their circumstances. For me, it started with a simple thing called kindness – people showing me loving kindness when I was unlovable. Just the Facts Be in Bakersfield is a grassroots movement aimed at changing the conversation around Bakersfield and activating positive change within our community. Find more information at www.beinbakersfield.com or on Facebook and Instagram @ beinbakersfield. When Michael Del Mundo first started playing water polo at the age of 9, he was less than enthusiastic. But in the end, his mom’s sink-orswim approach paid off. “My mom kind of made me,” said Del Mundo. “She made my brother do it (too) because she wanted us to swim.” During his first game and the eight-lap warm up, he got out of the pool crying, but his mom encouraged him to get back in – and he’s glad now that she did. lived, he shares a suite with four other students. As for living on the East Coast, he says one of the main differences from California is walking everywhere, and, of course, the weather. “It’s 20 degrees right now,” he said at the time of this interview in January. In addition to playing water polo in high school, Del Mundo was the Drum Major for the Stockdale High marching band. “It was a great experience,” he said of his alma mater. Great teachers and great staff (who were) always willing to help. I attribute my success to that.” He started playing saxophone in the fifth grade and still enjoys playing when his roommates aren’t around. He also took piano lessons when he was younger and is trying to learn a little more now. “There are pianos in the freshman halls and I’ll sneak away and go down there and play a little,” he said. He’s enjoyed exploring the East Coast and learning about its history. Cambridge, where the college is located, is slower paced than the nearby big city of Boston, so it offers the best of both worlds. He wants to have the full experience while in college, and his parents have always encouraged him to get a well-rounded education. The Winter Ball is a fairly new tradition at VAC. In its third year, it has a seen growth and has filled a need that has instilled hope and excitement into the community. to Xclusive Salon providing clients with fresh haircuts before the ball, VAC goes above and beyond and heightens the importance of the Winter Ball. “It shows them that they matter,” said Parker. “That people are looking out for their best interest. That Valley Achievement Center isn’t just a day care. We’re so much more than that.” VAC hopes to continue to meet the needs of the community. After all, the Winter Ball began as a void some teachers felt needed to be filled. “The idea came from the teachers that noticed that our students in regular schools weren’t going to proms or formals. So that’s where all this started. Everything with VAC starts from the parents seeing the need somewhere and addressing it to us and call it to action, making it happen,” said Parker. Locally Owned and Serving Kern County for more than 26 years! 661.631.2036 • 2029 21st Street KERN ALTERNATIVE CARE dba Alternative Care, Ca State License No. 154700004. “We want our community to know that we’re here, to know we’ll help them. Bakersfield is in our name; we’re just about the community.” – Thomas Freckleton, co-owner Bakersfield Sound Co.
difference for the future of music. “We knew we wanted to own something and be our own boss, but we didn’t know it would be a music store,” said Freckleton, who also plays bass and sings vocals for metalcore band Silent Planet. Dewar’s current location on Eye Street opened in 1930. Dewar’s Candy Shop in 1909. Standing on the left is James H. Dewar. Dewar’s was located at 1665 Chester Ave. until it relocated to 1120 Eye St. in 1930. Dewar’s advertisement Nov. 16, 1936, in The Bakersfield Californian. Soccer In March, the Garces boys soccer team won the CIF Southern California Division V Regional Championship, beating Pasadena-Marshall, 2-0, at Sam Tobias Field. Junior striker Ebubechukwu Ekpemogu scored both goals (his 42nd and 43rd of the season) while senior goalkeeper Jaime Tiscareno recorded his 19th shutout of the year for the Rams (26-2-4). Hockey The Bakersfield Condors have been red-hot for the past three months. The Condors went on a historic 17-game winning streak starting in mid-January, vaulting them into first place in the Pacific Division of the AHL. The 17 wins in a row is tied for the second most in AHL history. in 12 points and 11 rebounds for the Trojans, who won all five of their state playoff games by 12 or more points. The McFarland girls basketball team came up just short of winning a state title, falling to Oakland High, 5135, in the CIF Division III State Championship game. It was the Cougars’ first state championship game appearance and only third ever by a Kern County girls basketball team. Neli Diaz scored a game-high 13 points for McFarland, which finished the season with an impressive 31-6 record. ships held at Rabobank Arena in late February. South High’s Shareni Donis(fourth place at 150 pounds) was highest placer among local girls. Frontier seniors Ryan Morphis (138 pounds) and Trent Tracy (182 pounds) both took third place – the best finish for any local boy. Track and Field Liberty sophomore Reese Renz posted the fastest girls 300-meter hurdles time (44.65 seconds) in the state during the Kern Invitational on March 9. During the same meet, Stockdale senior Marcus Mota recorded the second fastest time of the year in the state in the boys 3,200 (9:18.27). Shafter landmarks now available Original watercolors to delight the eye. Call to see. Four oil paintings on display at AltaOne Federal Credit Union, 11211 River Run (off Buena Vista). Watercolors on display from France at The Art Center, 1607 19th St. To contact the artist, Charlotte White, call 661-330-2676. Hoffmann Hospice Veteran to Veteran Volunteer Les Weller (5th from left in group photo) salutes and celebrates Hoffmann Hospice patient and fellow veteran Walter Jones. Shop Hustler Hollywood, the premier romance and lifestyle boutique, for the sexiest selection of lingerie, shoes, novelties and more. See what all the buzz is about at Hustler Hollywood. 3601-B Ming Ave.
SECRET COMPARTMENTS From cubbyholes to rooms. Proprietary design of hidden doors (not found in books or on the internet). Emergency preparedness a specialty. I can show you exactly what you need... and how to keep it secure! KEEP celebrates 50th anniversary To commemorate the 50th anniversary of Camp KEEP, the KEEP Foundation is hosting its annual Wine Camp for KEEP fundraiser at the Alexander residence, located at 404 Mt. Lowe Drive in the Olde Stockdale neighborhood. The event will take place on Saturday, April 27, from 6:30 to 9:30 p.m. Tickets are $50 and include dinner, wine tasting, craft beer, a blind wine pull, a commemorative wine glass, entertainment, and a host of opportunity baskets and raffle prizes. All proceeds raised will help send kids in need to KEEP. Stockdale Elementary student Luke Meszaros at a recent visit to Camp KEEP. flowing seamlessly together. The kids are highly engaged and it’s exciting to witness the joy that various aspects of the program bring to the students. For some, it’s the first time they have the opportunity to see the ocean, hold a snake or climb to the top of a mountain. Each evening culminates with everyone gathering around a blazing campfire for an hour of songs and storytelling at KEEP’s amphitheater. Then, it’s lights out. It was a long, exhausting week, to be sure. But I survived and in hindsight, it will go down as one of the best, most memorable weeks ever. It was transformational on many levels for both the students and me. If you ever have an opportunity to visit Camp KEEP as a counselor – take it! In the meantime, to learn more about Camp KEEP and its rich 50-year history, visit www.campkeep.org/ 50years. Advance tickets are required and can be purchased at www.winecampforkeep.com. With an available torque-vectoring AWD system, 280 horsepower* and plenty of cargo room, this rugged SUV is fully equipped to turn any outing into an unforgettable adventure. With three advanced powertrains, a revolutionary new design and Honda Sensing® standard on all models, the new Accord is the most impressive Honda yet. Trust the Locally Owned Dealer who’s been Serving Kern County for over 60 Years! 1. MSRP excluding tax, license, registration, options. Includes $975 destination charge. Dealer prices may vary. 2. MSRP excluding tax, license, registration, options. Includes $890 destination charge. Dealer prices may vary.